SHANGHAI -- Tesla removed a Chinese term for "self-driving" from its China website after a driver in Beijing who crashed in Autopilot mode complained that the company overplayed the function's capability and misled buyers. A check of Tesla's Chinese website on Sunday showed that the word Autopilot had also been removed. But that term was subsequently reinstated on Monday. "At Tesla we are continuously making improvements, including to translations," a Tesla spokeswoman said on Sunday in an emailed statement to Reuters when asked about the removal of the terms Autopilot and "self-driving." "We've been in the process of addressing any discrepancies across languages for many weeks. Timing had nothing to do with current events or articles." 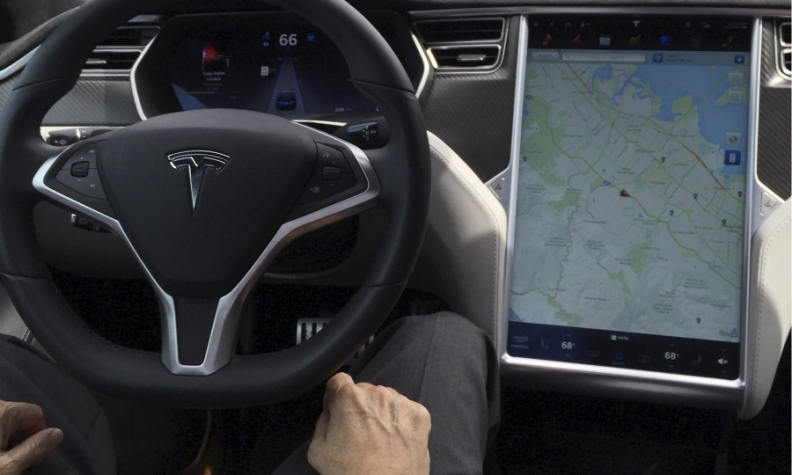 References to autopilot and the term "zidong jiashi," which most literally translates as self-driving, although also means autopilot, were taken off the web page for the Model S sedan by late Sunday, according to a comparison with an archived version of the page. Both terms previously appeared several times on the site. Instead, a phrase that translates as 'self-assisted driving' is used. Tesla China staff have additionally undergone training in response to the Aug. 2 crash to re-emphasize that employees must always keep two hands on the wheel when demonstrating the Autopilot function, according to a Tesla employee who was not authorized to speak to the media. Reuters was first to report last week that Tesla said it downloaded data from the Beijing car and confirmed it was in autopilot mode at the time of the crash, although the driver was not detected to have his hands on the wheel. The spokeswoman for the U.S. automaker issued a statement saying that the system was not self-driving but merely assistive and that drivers were responsible for always maintaining control of the vehicle. The crash is another hiccup for Tesla in the Chinese auto market, the world's largest, after it initially struggled with distribution and charging issues. Various Chinese government ministries did not respond to requests for comment on the Tesla crash and self-driving policies.